Perhaps the most unfortunate effect of the loss of water at pay someone to do your assignment Riverside since 2002 is the death of the majority of the mature trees in the Cemetery. There at least 100 dead trees at Riverside, and unfortunately some of these trees are now threatening many of the monuments in the cemetery. At least two of the trees have fallen over and dislodged monuments in the past three months, and the situation is bound to get worse. 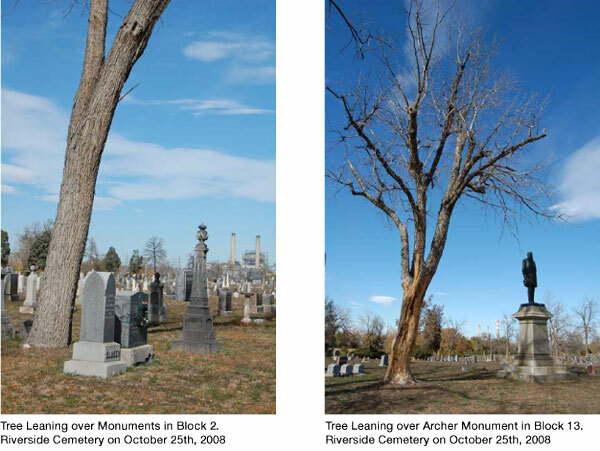 These photos shows just two of the “leaning trees”, one in block two and one in block 13; the tree in block 13 is endangering the monument to Colonel James Archer (1824-1882), who helped to bring gas lights and a piped water system to the City of Denver.